The first thing you will need on arrival is the local currency. 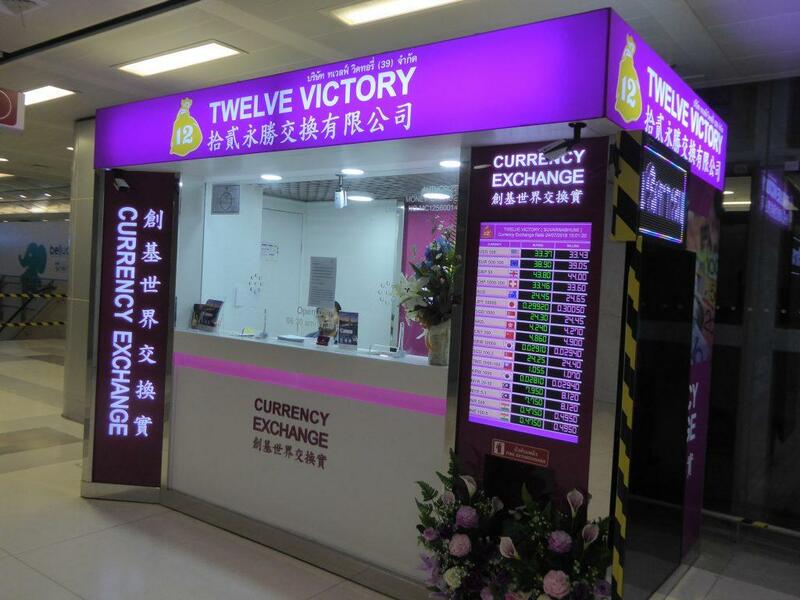 As soon as you’ve disembarked from your flight you will start seeing Thai bank exchange booths as you make your way towards immigration. 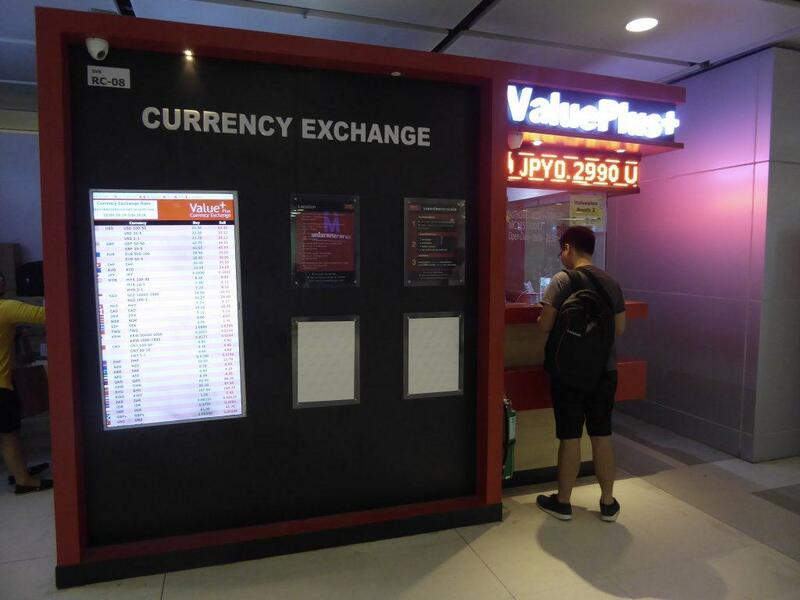 These offer a lower rate than those in the arrivals hall which in turn offer lower rates than some exchanges in the basement level of arrivals in the airport link train terminal. This can amount to as much as 15%. 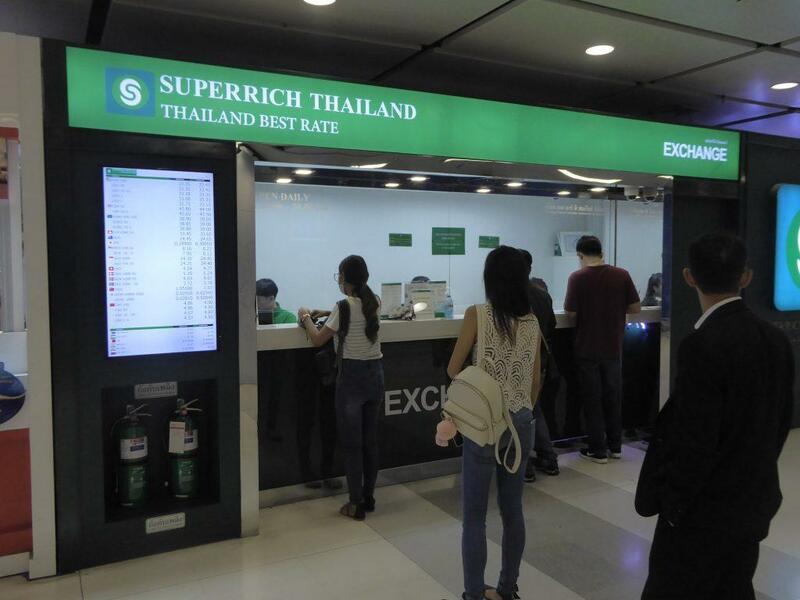 The best rate is always offered by SuperRich (orange color booth) located to the left of the airport link train ticket booth at the basement level of arrivals. They also have a booth just inside the entry gates of the station. Similar rates are available at Super Rich (green), Twelve Victory, and Value Plus exchanges. Check the example below of the different rates on offer on a recent day using departure from the UK and 1GBP to THB as a guide. There are ATM machines throughout the airport terminal once you have exited immigration and customs. After clearing customs and entering the arrivals hall get yourself an International Tourist Sim Card. There are three local service providers… DTAC, True Move, and AIS. They all have counters here. Sometimes there are promotions with free sim cards. 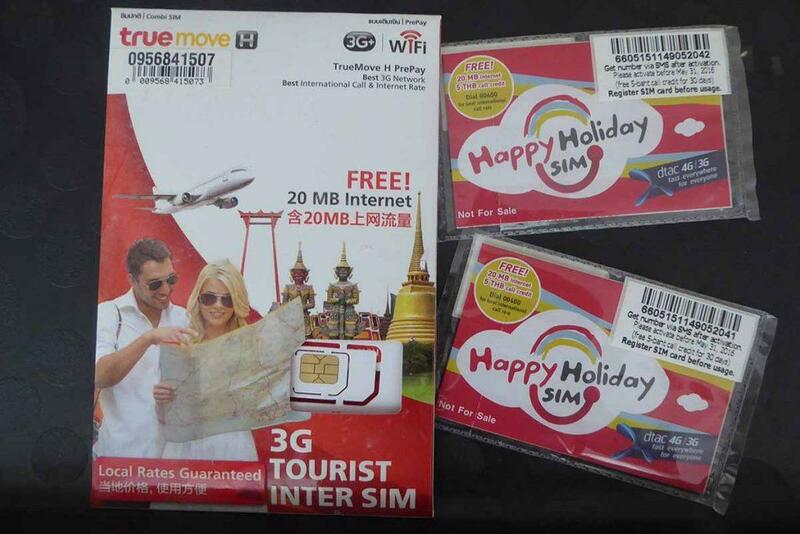 The Sim card comes with 100-baht free credit but you must pay for a package. 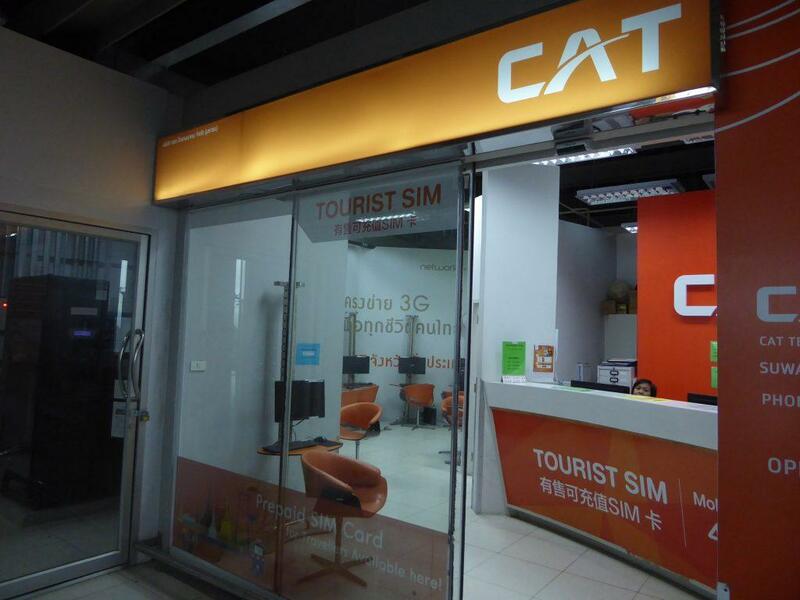 They all offer similar 3G/4G unlimited internet packages at 199/299/599/1000 baht for 7/15/30 days and unlimited calls to users of the same network. International calls start from 1 baht a minute, local calls 0.99 baht/minute, local/International SMS/MMS 2 – 15 baht/message. You can check out the best deals on the service provider’s websites below. Credit is added easily at convenience stores like 7 – 11, online or at the service provider’s own stores which are usually found in every shopping mall. You must register your Sim card before you can use it. You will need to show your passport. Also, it is important that your phone is unlocked before you can use a Thai sim card though you can buy a phone locally from around 350 baht for something basic. Smartphones start at around 2000 baht. 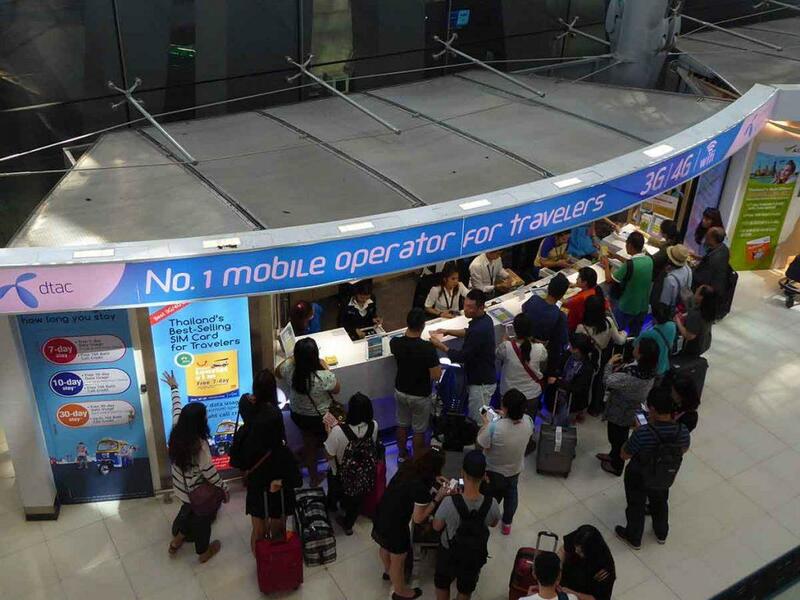 You can order and pay for a Dtac sim card online in advance before you leave home and pick it up at the airport when you arrive. 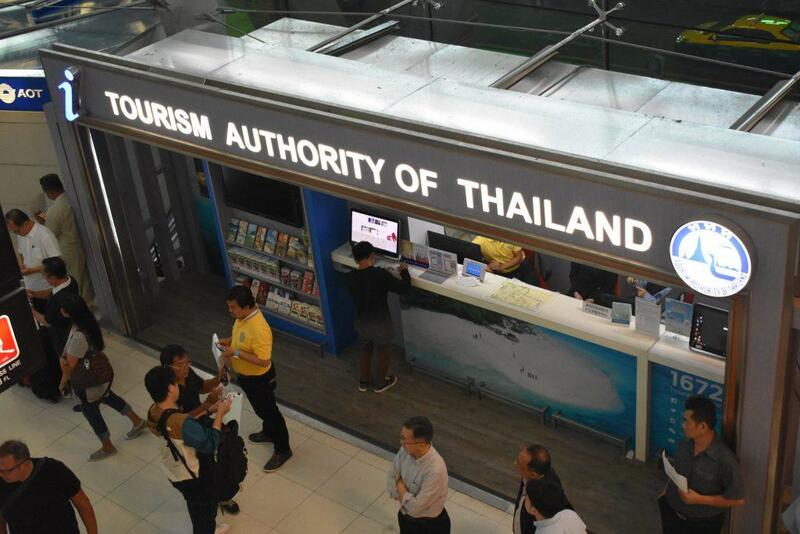 There are several Airport Information Counters in the passenger terminal and an official Tourism Authority of Thailand tourist information counter in the arrival hall. Ignore the other tourist information counters and head for the TAT who don’t try to sell you tours, hotels, and taxis. They have a host of free maps & brochures for all regions of Thailand. 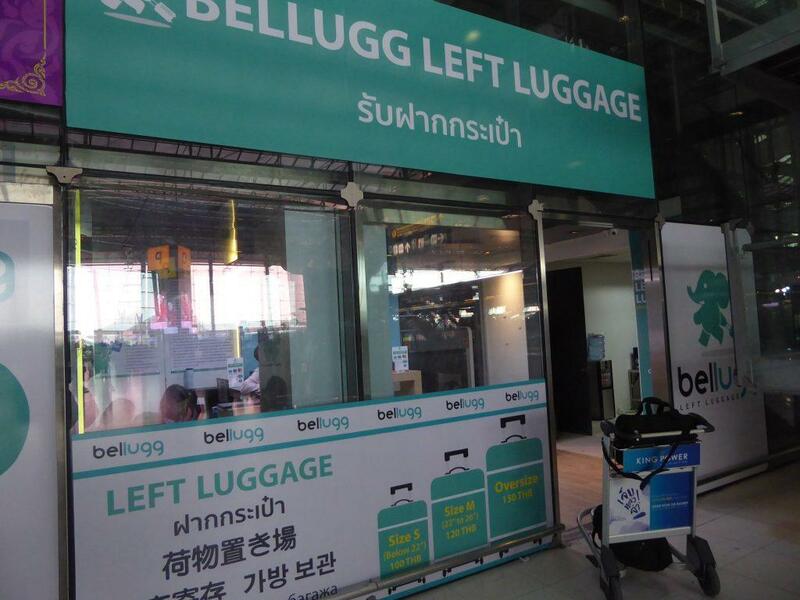 There is a Bellugg left luggage office on the arrival & departure levels charging 100 baht per day (small), 120 baht per day (medium), 150 baht per day (large). 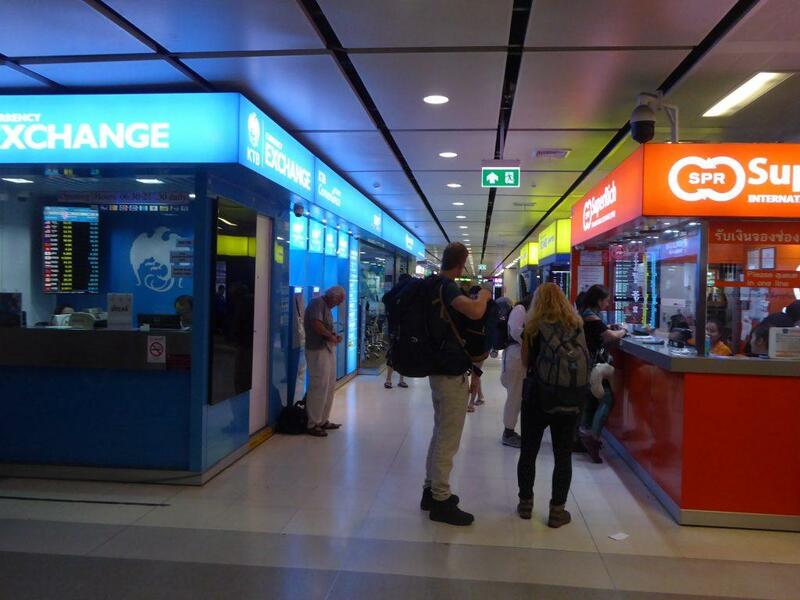 At the basement Airport Rail Link station concourse, there is an AIRPORTELs left luggage office charging 100 baht per bag (any size/weight) per 24-hours. They also accept golf bags, bicycles, sporting equipment, and laptops. Delivery to hotels is also available. 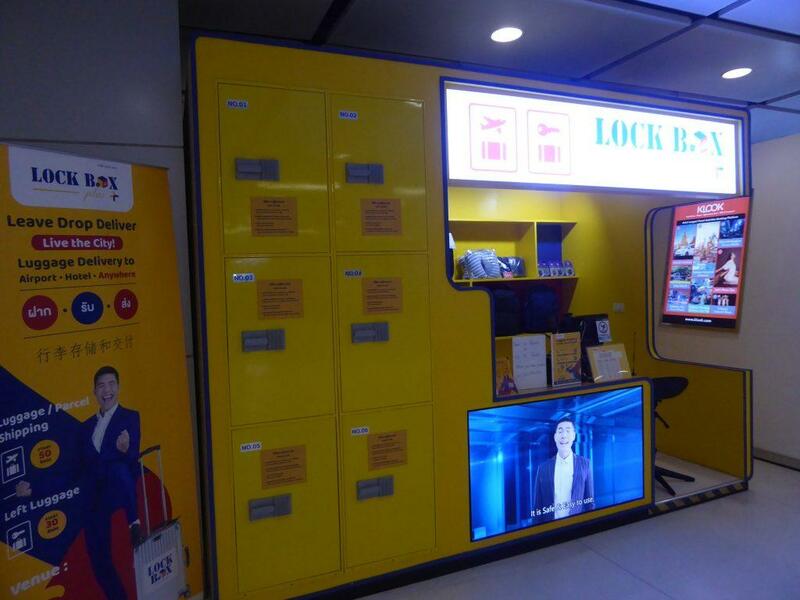 There are also left luggage lockers on the basement airport link train concourse. Charges are 50 baht per hour or 300 baht per day. Minimum of 2 hours. They also offer luggage delivery to anywhere in the city or Thailand. 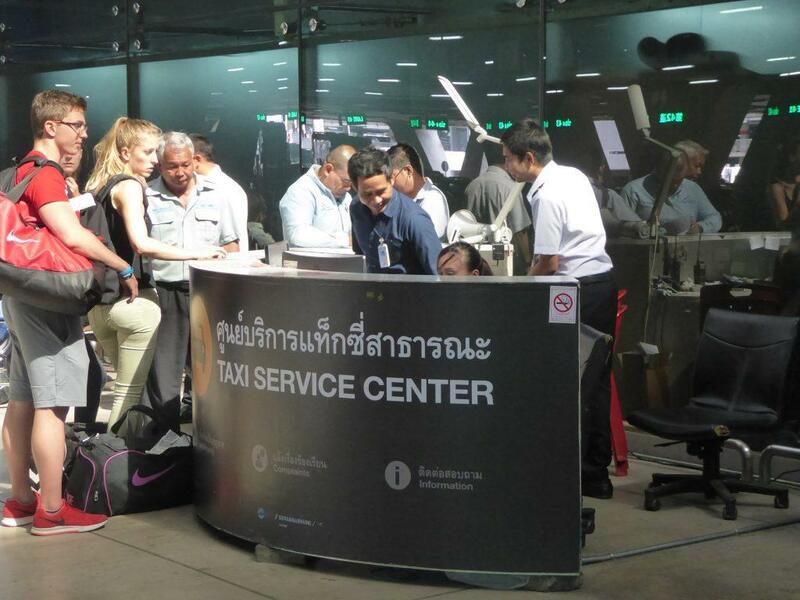 The charge is by the kilo with a 30-kilo piece of luggage costing from 350-500 baht depending on size. If you need medical help there is a 24-hour Medical Center on the 2nd floor. A 24-hour Post Office is in the international departures concourse with a CAT Internet Cafe next door. Free WiFi is available within the passenger terminal. There is a good choice of shops, cafe, and restaurants such as Starbucks, Burger King, Family Mart and Boots on the 3rd floor of the passenger terminal. There are also branches of the Family Mart convenience stores on the departure level. Subway and 7-11 are in the basement next to the airport train terminal. 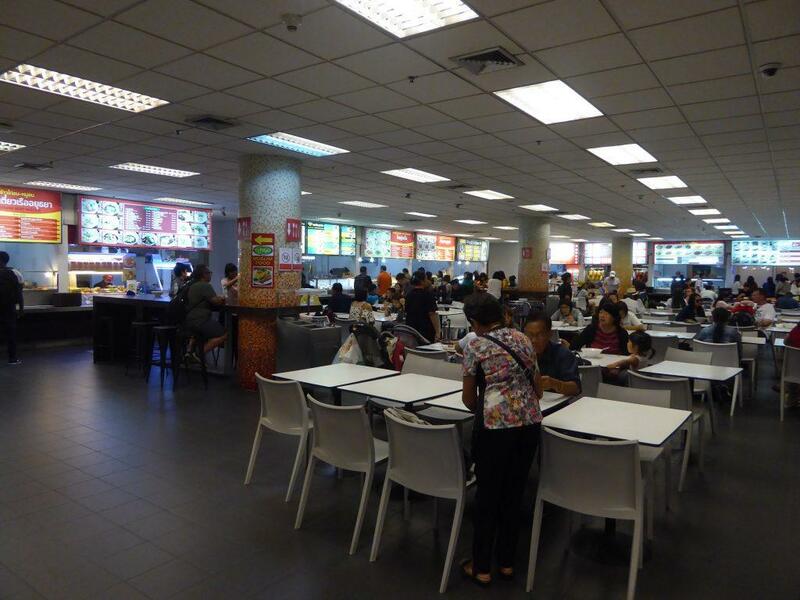 Food is expensive in the terminals with chain fast food outlets charging about 20% above their usual prices. 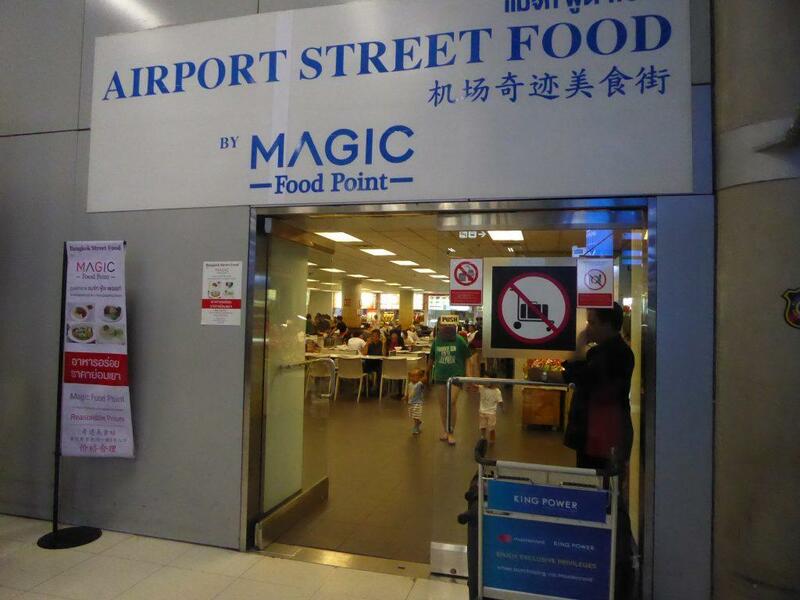 The cheapest place to eat in the airport is the Magic Food Point on the ground floor of the passenger terminal near gate 8. It’s open 24 hours and features Thai style street food. Dishes range from 50-80 baht and coffee is 30 baht. You need to buy coupons at a booth to use as payment. The Novotel Suvarnabhumi Hotel is 300 meters from the passenger terminal and is reached via an underground walkway or via the hotel’s shuttle van. 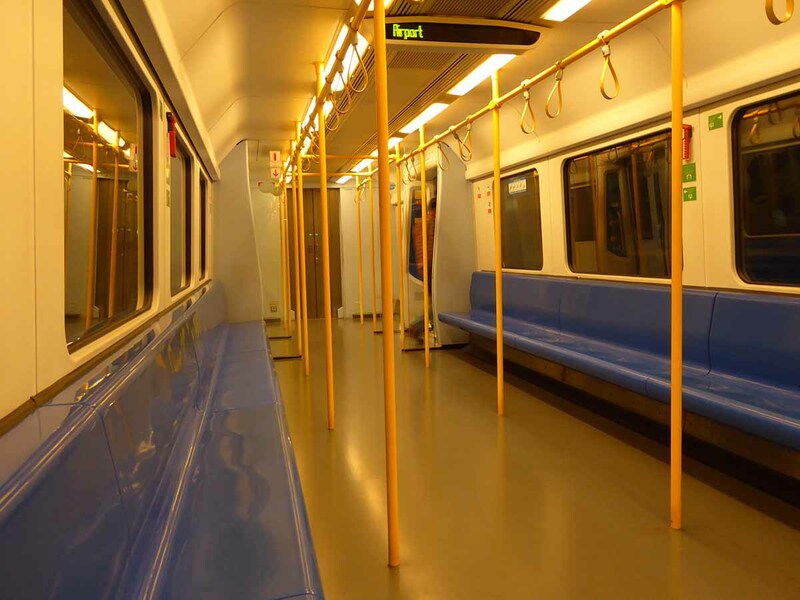 There is also paid by the hour Boxtel in the basement airport rail link station. The charges are 650 baht for 2 hours and increasing by 300 baht per hour afterward. Minimum stay is 2 hours. 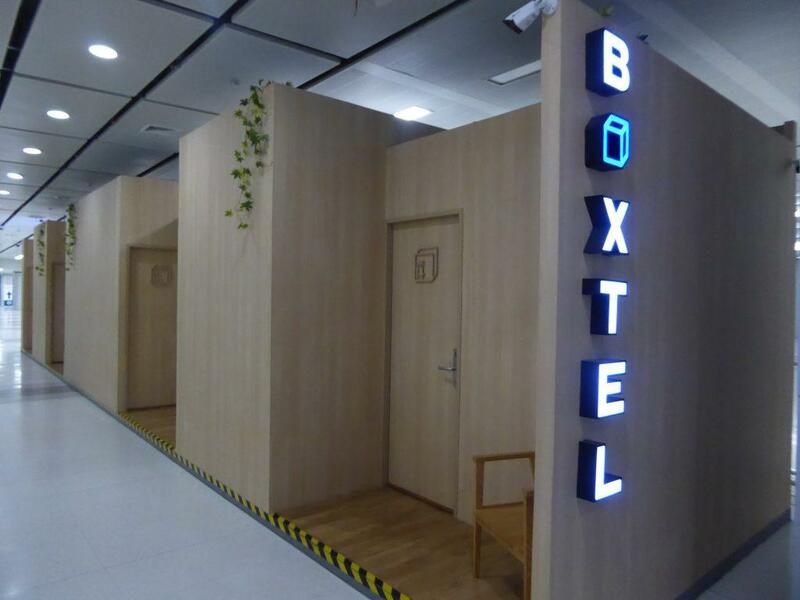 There are other hotels and hostels near the airport. More information here. Public taxis depart from outside gates 4 and 7 on the 1st floor of the passenger terminal. The taxis have meters and the fare depends on the distance traveled. 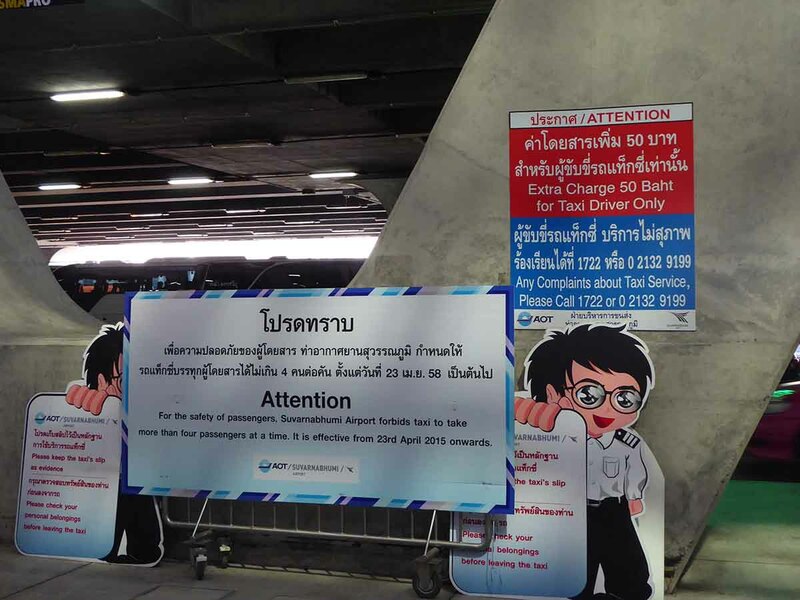 There is a 50-baht surcharge added to the fare and the passenger must pay the tollway fares. There are three different classes of taxi, short distance taxis for local destinations, destinations in the city using either a regular taxi for passengers with less luggage or a large taxi for passengers with excess baggage. You will need to take a ticket from the ticket machine and go to the bay with the same number as your ticket where your taxi will be waiting. There is an attendant at the ticket machine area if you need help and a help desk. Service is 24 hours. Make sure the taxi driver turns the meter on and keep your receipt from the taxi stand if you need to complain later. Most taxi drivers are honest but some are not. The rough cost of a taxi into central Bangkok is normally around 350 – 450 baht including tollways and surcharge. If you are going to Pattaya you can book a taxi online to meet you at the airport. 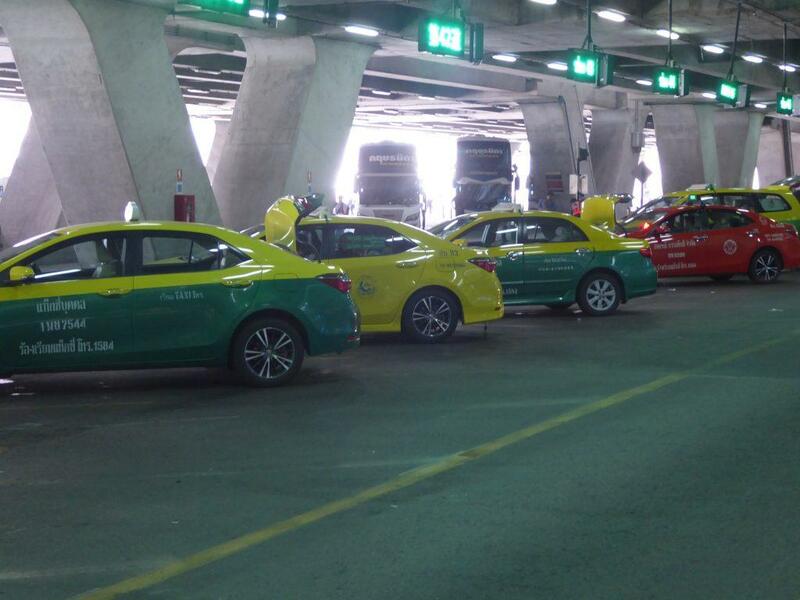 Taxis also leave for Hua Hin. You can make a booking in advance here. You can book online to other destinations outside Bangkok here. Only use the official taxi rank and ignore offers from unofficial touts in the terminal who will try to overcharge you. The airport train station is on the basement level of the passenger terminal. Service hours are 06.00am – 24.00. Trains leave every 15 minutes and take 30 minutes to arrive at Phaya Thai terminal station which has a walkway to the BTS Phaya Thai station. The fare is 45 baht. 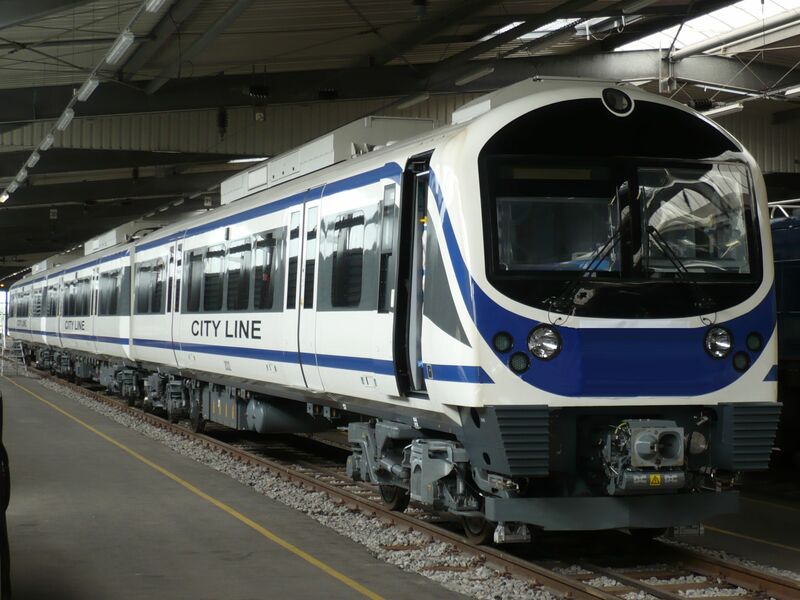 The train also serves as a commuter line stopping additionally at six stations en-route. 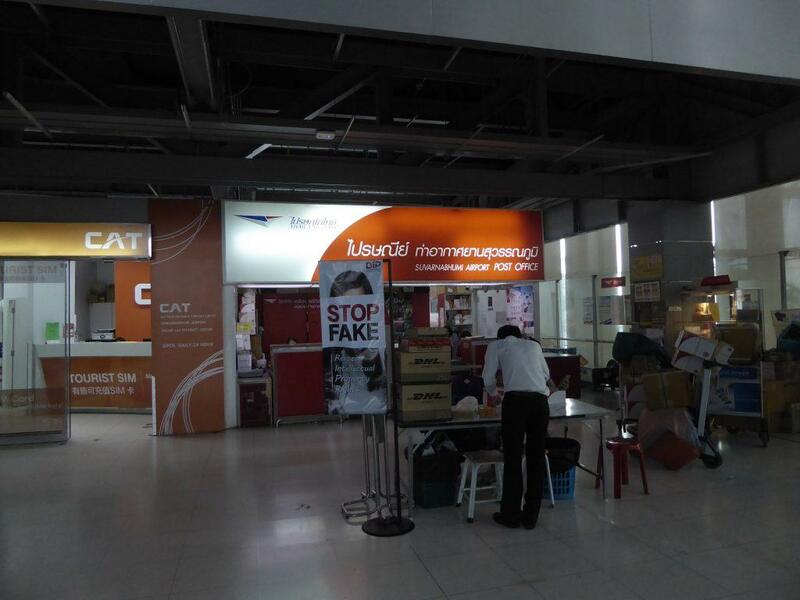 Centrally there are stops at Ratchaparop and Makkasan stations. Makkasan station has a walkway to the MRT Phetchaburi station. If you are heading to Khao San Road from Phaya Thai terminal you can take the orange air-conditioned bus number 59 (inbound). This will take you all the way to Khaosan. You will need to turn left at the station street-level exit and walk about 100 meters to the bus stop. It would be easier to take the S1 bus from the airport. 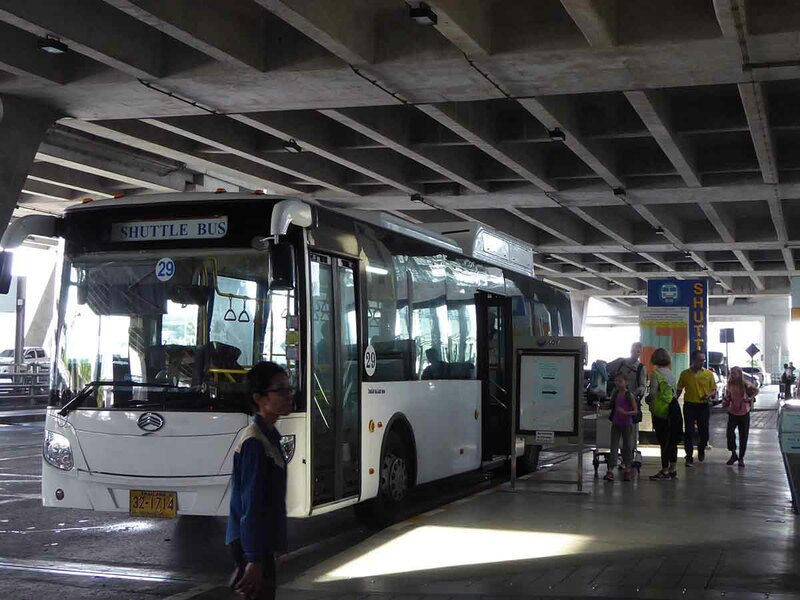 Phaya Thai has a taxi stand underneath the walkway leading to the BTS station. Only take a taxi that uses the meter. Ratchaparop station is within walking distance to hotels in the Pratunam district. You can catch a taxi outside the station exit. Bus 183 (outbound) connects to Khao San Road. Makkasan station is in a heavily congested traffic area. It is difficult to find a taxi as drivers tend to avoid it. 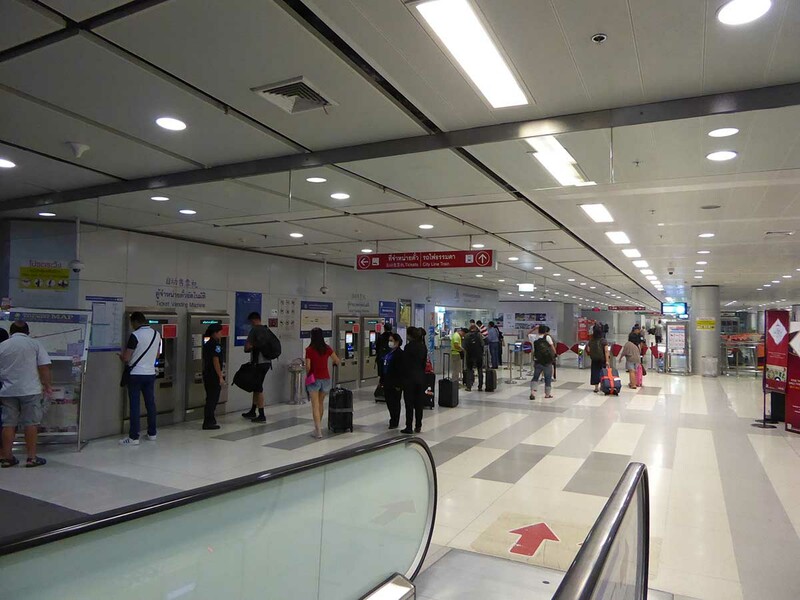 Note that Airport link stations apart from the Airport terminal station are poorly designed for passengers with heavy luggage due to a lack of lifts and escalators. You may have to descend flights of stairs with your luggage. 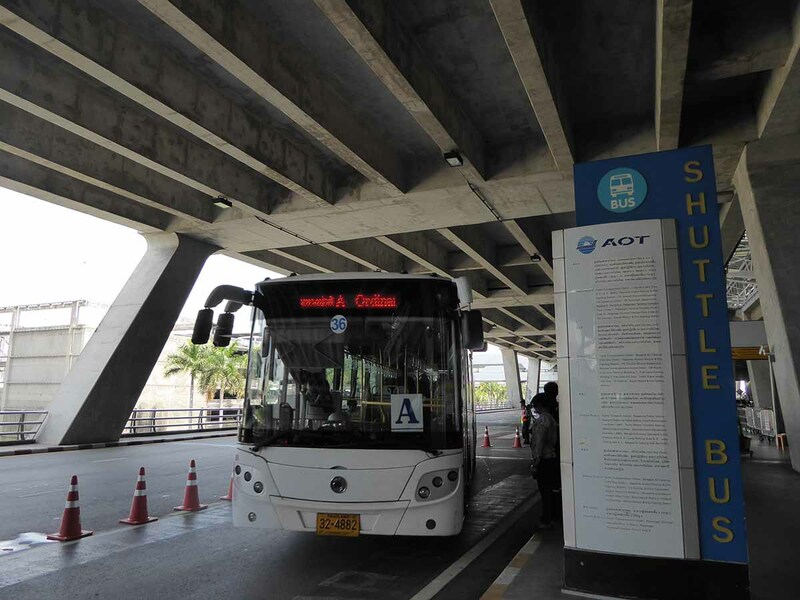 Airport Bus S1 runs to Khaosan Road. It departs every 30-45 minutes between 06.00-20.00 from Gate 7 on the 1st floor of the terminal. The fare is 60 baht. The bus takes the express-way stopping at Yommarat (Chinatown), Lan Luang Road, Tanao Road, Banglamphu (Khaosan Road) and Sanam Luang. The bus returns to the airport via the same route. There is a 24-hour minibus service to central Bangkok. 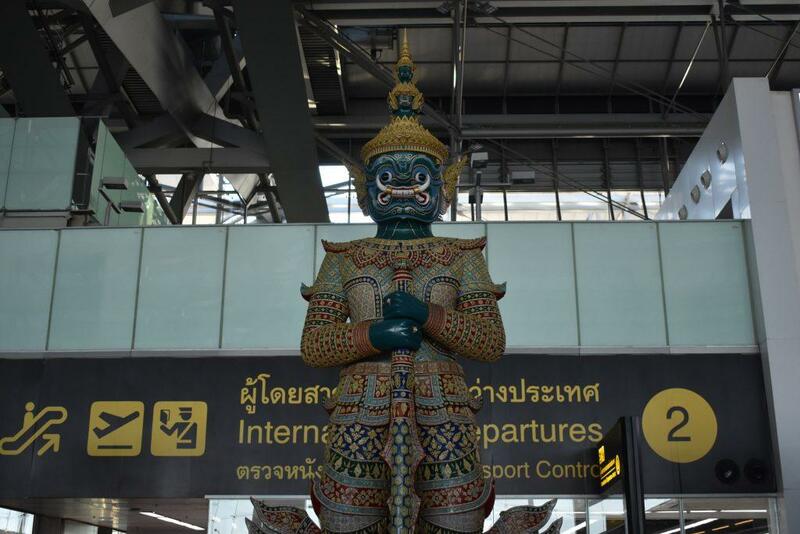 Departures from the airport leave at 01.15, 02.30,(to Bangkok hotels) 05.30, 08.30, 12.00 & 19.00 (to Interchange 21 Building at Asoke – BTS/MRT). The same company runs a minibus to Khao San Road leaving the airport at 01.15 and 02.30. These are convenient if arriving late after the Airport Bus and Rail Link has stopped. Buy Tickets Here. 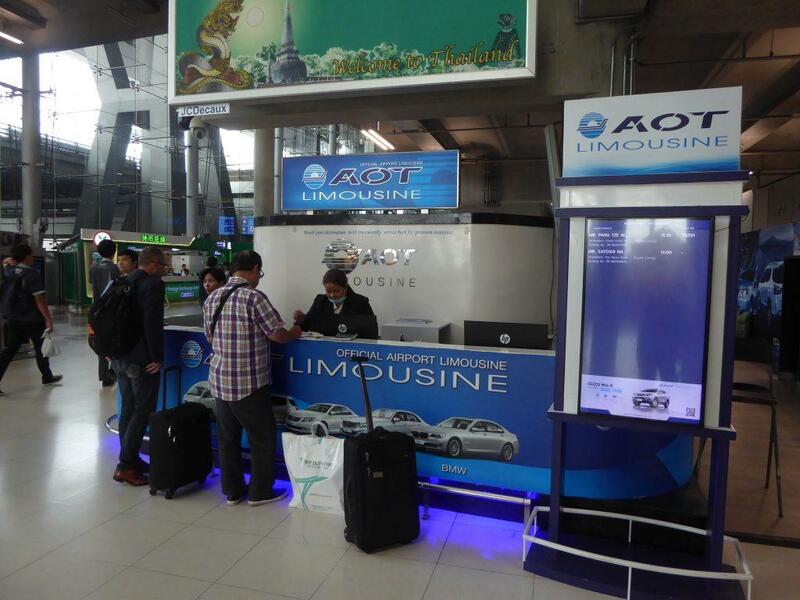 AOT run a Limousine service to locations in Bangkok. Offering 6 kinds of vehicle. Prices range from 1100 – 2300 baht depending on vehicle and destination. 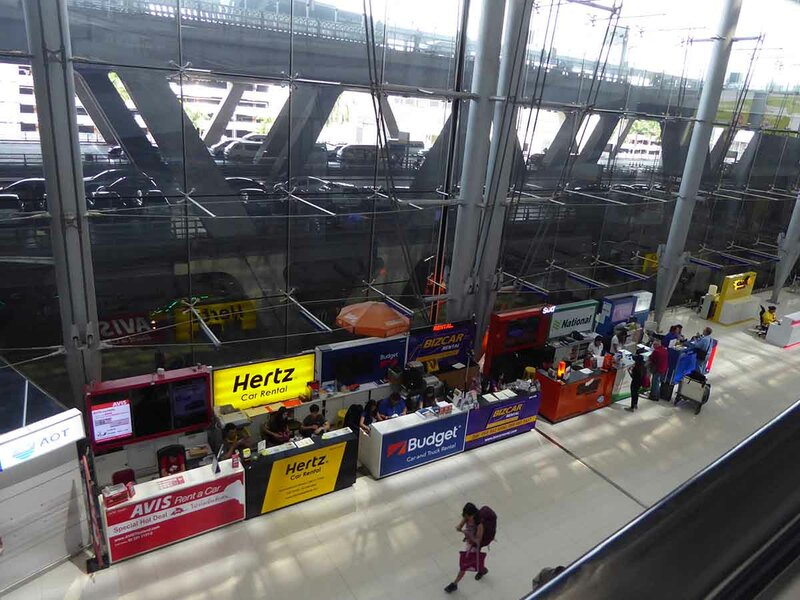 The booth is on the 2nd-floor arrivals hall in the passenger terminal. 24-hour service. 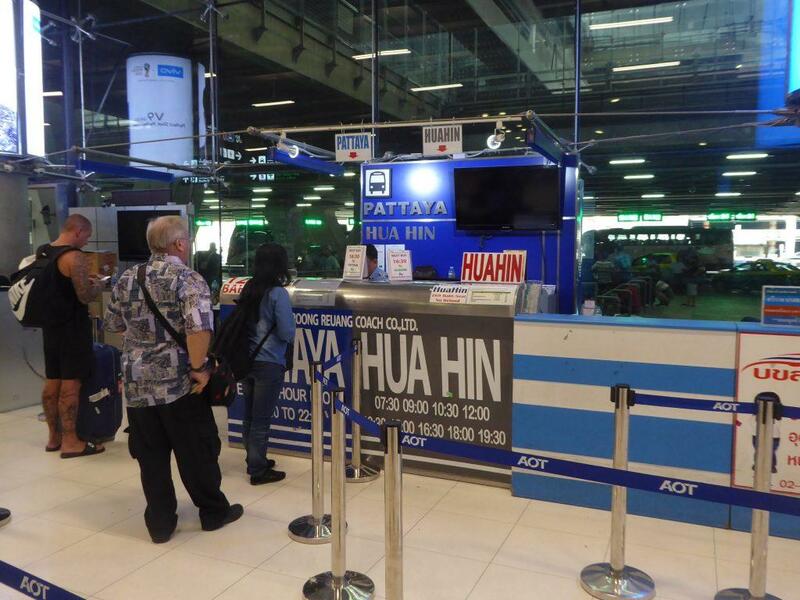 A Van to Khaosan Road runs from a ticket booth next to the Hua Hin – Pattaya bus ticket counter on the ground floor of the terminal building. Tickets are 100 baht. Public buses & other Passenger vans depart from the Airport Transit Centre though they mostly run to the outer suburbs, not the city center. 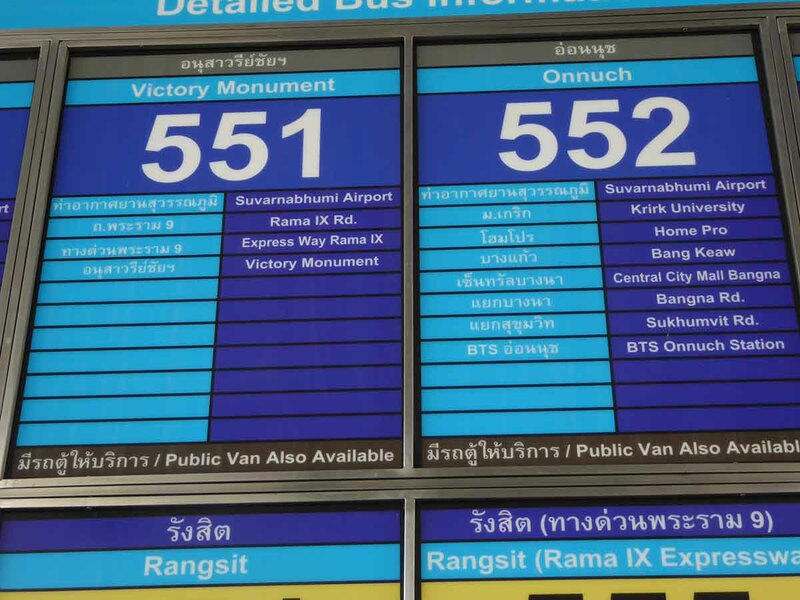 The exceptions are bus/van 551 which runs to Victory Monument and bus/van 552 which runs to BTS On Nut station. The fare is 35 baht and the route is mostly on the expressway. To get to the transit center you need to take the free shuttle bus. 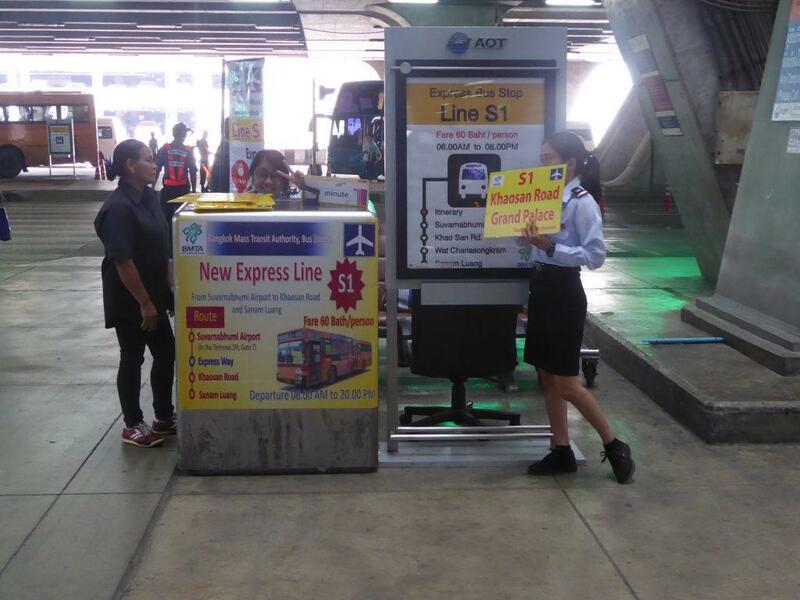 The express service departs from exit 5 on levels 2 & 4 every 5 – 15 minutes, 24-hour service. 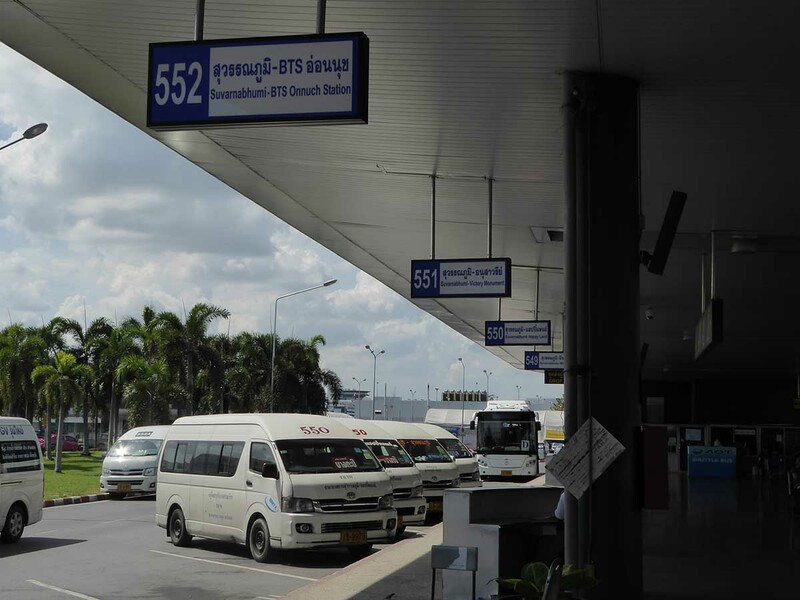 If you have a connecting flight departing from Don Mueang airport there is a free shuttle bus departing every 30 minutes from exit gate 3 on the 2nd floor. 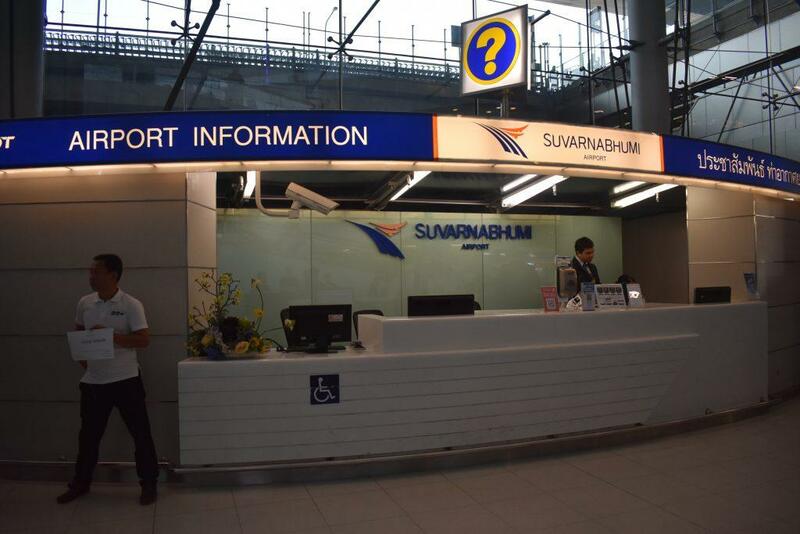 You must show your flight ticket from Don Mueang to use this service. Service hours are 05.00 to 24.00. 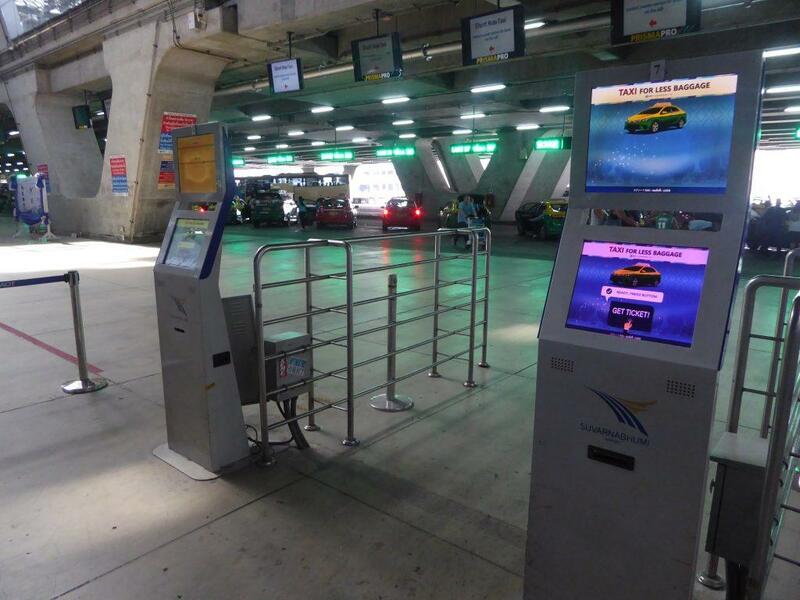 If you need to book a taxi to Don Mueang you can do so online in advance here. 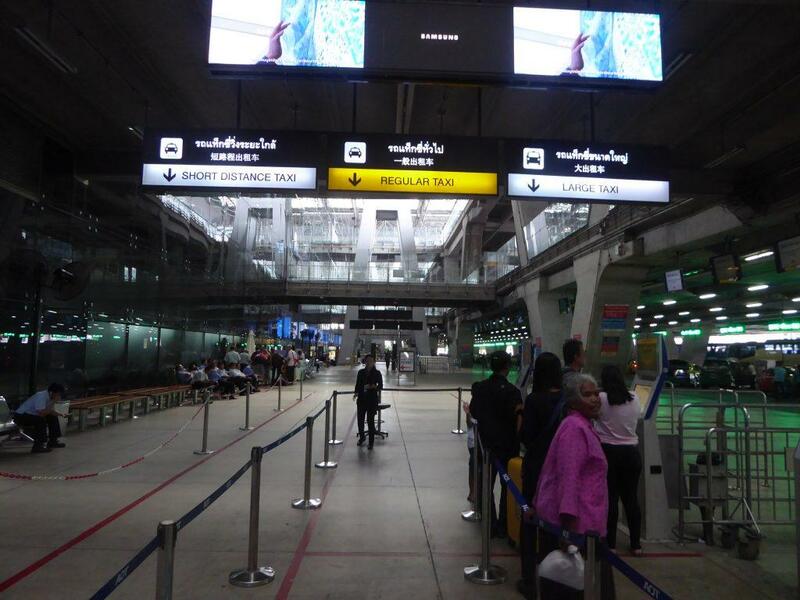 Buses to Hua Hin and Pattaya and other destinations leave from the ground floor of the passenger terminal. More buses depart from the transit center. You can book bus tickets from Suvarnabhumi to Hua Hin, Pattaya, Khon Kaen, Koh Lanta, Udon Thani, Nong Khai, Ko Chang, Trat, Mukdahan, and more. Book online with our partner 12Go Asia. Search & make reservations using the form below. A Van to Khaosan Road runs from a ticket booth next to the Hua Hin – Pattaya counter. Tickets are 120 baht. The service is every hour from 07.00 until 23.00. All the car rental companies have booths at gate 8 on the 2nd floor of the passenger terminal. Thai’s drive on the left. You will need a valid International driving license. Check that you are fully insured for any vehicle that you hire.